I’ve always loved hearing stories and insights from the early days of Toyota’s building their lean culture. Tracey and Ernie Richardson were there in 1986 when Toyota started up the first US factory in Georgetown, Kentucky. When Tracey Richardson called about a year ago for advice on writing her story, I was a great fan of the idea. 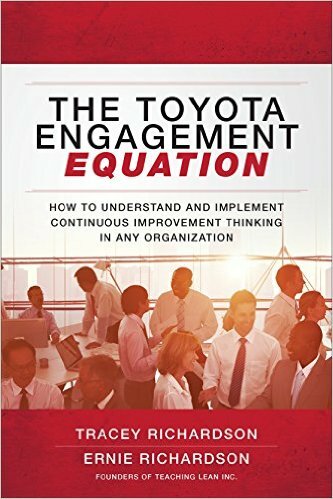 In their book, The Toyota Engagement Equation: How to Understand and Implement Continuous Improvement in Any Organization, to be published from McGraw-Hill in May 2017, they take the reader deep inside their story. 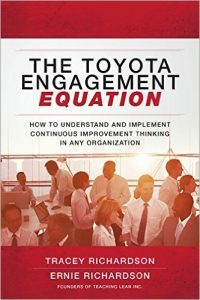 It is a unique, first-hand account of how Toyota created a culture of continuous improvement and mutual respect between management and workforce in the American heartland. The lessons in this book are practical and widely applicable. The book is organized in three parts. The first revolves around how Tracey and Ernie were hired and trained at Toyota. This section is full of great stories and personal reflections. There are plenty of lean books written by academics or Toyota managers, but this is the only explanation of TPS that begins with a 19-year old woman as a Toyota new hire. It offers great inside perspective on how Toyota grows a person from a shop floor worker to a leader. The second part describes the elements of TPS as a thinking people system, building on the Richardson’s decades of experience with practical problem solving, at Toyota and beyond as they continue their teaching beyond worldwide. The final part of the book brings together the key themes of the book and explains how Toyota engages everyone everyday, putting people first and creating alignment. Tracey and Ernie Richardson were featured in one of my favorite Gemba Academy podcasts. Tracey has been sharing amazing bits and pieces of her insights, original documents from her Toyota days, and updates from her adventures with Ernie as they help clients with their lean transformations. If these topics interest you be sure to connect with Tracey on LinkedIn and Twitter. And be sure to order your copy of the book! Great article Jon. How can I get an autographed copy? I have been following Tracey and Ernie and can’t wait for their book to come out. Good luck guys! I suggest connecting with Tracey via Linked In or Twitter or whatever social media you have in common, and asking her to sign you book.